This week we have a Trunk Show of models from JBW Designs. Judy’s designs are very feminine and tend to be French Country. She has things for weddings, babies, holidays and more. The JBW models will be here until the end of January. Stop by and check them out. 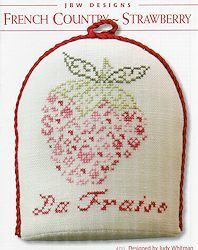 Today we received BIG RED HOUSE, a beautiful colonial-style sampler by La-D-Da. Good January project. Little House Needlework has a new small kit. BIRDHOUSE ALPHABET is a small sampler stitched with Beanstalk Belle Soie by Crescent Colours. This silk is a wonderful stitching fiber and is included in the kit along with two buttons to be used as the flower centers. It is not too late to sign up for the Little Sheep Virtue program that we told you about last week. We are still collecting names.